When Nouvelle Autoroute 30 CJV S.E.N.A. was entrusted with the extension of Highway 30, which will relieve traffic congestion in the Montreal area by provining an alternate route via a southern bypass road, they required a bridge over the St. Lawrence Seaway at the Beauharnois Canal. This new two-lane-divided Beauharnois Bridge will span 2,550 metres in length and will allow a clearance of 38 metres for canal traffic below its structure. The NA 30 Consortium selected BAUER Foundations Canada (BFC) to provide the bored cast-in-place concrete piles for the new Beauharnois Canal Bridge. BAUER Foundations Canada was awarded the contract for the construction of the 138 bored piles with a 2,000 millimetre diameter permanent casing and an 1,850 millimetre diameter rock socket with varied embedment of four metres to 7.1 metres for the new A-30 Bridge over the Beauharnois Canal, located near Montreal, Quebec. The designer, Arup, would require the new Beauharnois Bridge to have 32 land piles (with a four metre rock socket), 28 land piles (with a 7.1 metre rock socket) and 78 offshore piles (with a four metre rock socket). The permanent casing of the Canal Piles had to be drilled directly into the bedrock, since there was virtually no overburden. These 138 bored piles will provide the deep foundations for the piers of the new Beauharnois Canal Bridge. The depth of the bored cast-in-place piles varied to a maximum of 24 metres, both on land and on water, with the riverbed also varying from 4.2 metres to 13.6 metres below the waterline in the canal. The area of Beauharnois is part of the Saint Laurent geologic region and its bedrock is made of either quartzite or dolomitic sandstone, a very hard and highly abrasive rock with strength up to 390MPA. 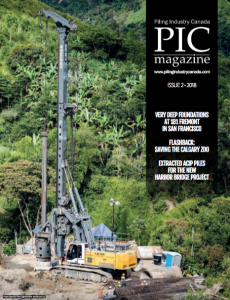 BAUER Foundations Canada’s solution was to use a drilling technique which allows withdrawing large diameter cores from the ground by slowly grinding the bedrock on the periphery with BAUER’s own powerful rotary drilling rigs. The 78 offshore piles were drilled into the rock by two BG 40s on specially designed barges to stabilize the work platforms in the strong canal current. The self-levelling barges also had to compensate for the constantly changing water level due to a power plant just three kilometres away from the worksite. The pilot piles for these offshore bored piles were accurately placed to the project specifications utilizing the GPS capabilities of the BAUER modified barges. An IB10 drilling machine was used to drill a 203 millimetre pilot pile for each of the offshore 2,000 millimetre bored piles. These pilot piles would be later used as a location guide while boring the larger 2,000 millimetre piles. The most interesting challenge was that most of the bored piles drilled off­shore from the barges on the Beauharnois Canal had virtually no overburden to maintain the permanent casings while rock drilling. Thus, several newly designed BAUER drilling tools were utilized and tested on this project to make this task faster and easier to help support the seasonally challenging schedule. Upon commencement of the first drilling operation, BFC crews completed the 138 bored cast-in-place concrete piles for the new Beauharnois Canal Bridge ahead of time. This proved to be a satisfying challenge against the hard rock and the winter weather, which allowed the final pile to be finished just before Christmas of 2010.